Nowadays, smartphone manufacturer companies are providing additional features in Android OS. Like, you can find system-wide dark mode in OnePlus devices. Dark mode not only reduces eye strain while using mobile at night. Also, does save smartphone battery. Officially, Google is also, going to introduce a dark mode in the final version of Android Q. In the beta version of Android Q, you can enable dark mode by turning on battery saver. 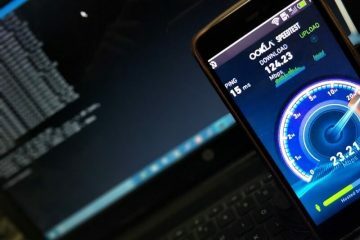 System-wide dark mode of smartphones is limited to the system Apps. It doesn’t work in Apps like Facebook and WhatsApp. 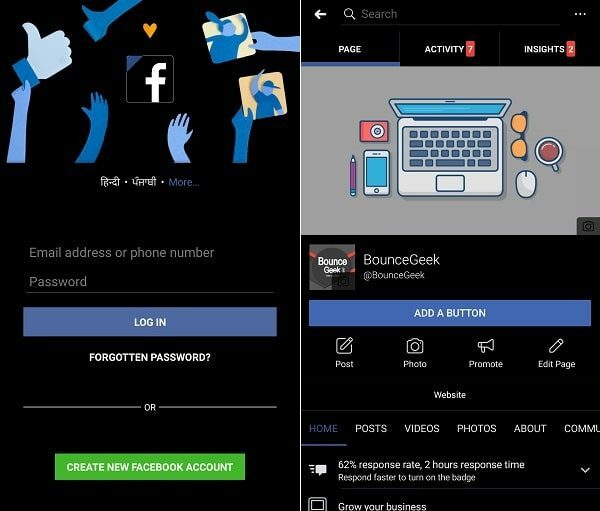 So, In this article, I will tell you, how to enable dark mode in the Facebook App. Also, you will get to know, way to enable dark mode in the Messenger App. First, I would like to clarify that – there isn’t any official option available to enable dark mode in the Facebook App. That’s why I am going to tell you about multiple methods. 1 Activate Dark Mode Facebook. 1.1 Use the Friendly for Facebook App. 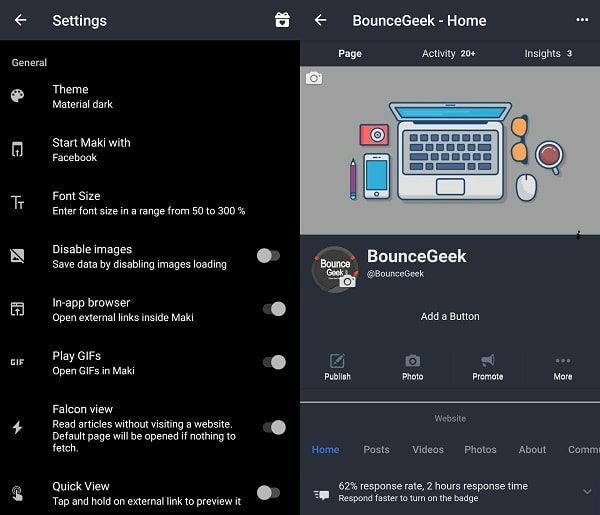 1.2 Facebook Dark Mode in Firefox Android. 1.3 Use Maki for Facebook and Messenger. 1.4 Activate Hidden Dark Mode in Messenger. 1.5 Install Dark Facebook App. Use the Friendly for Facebook App. 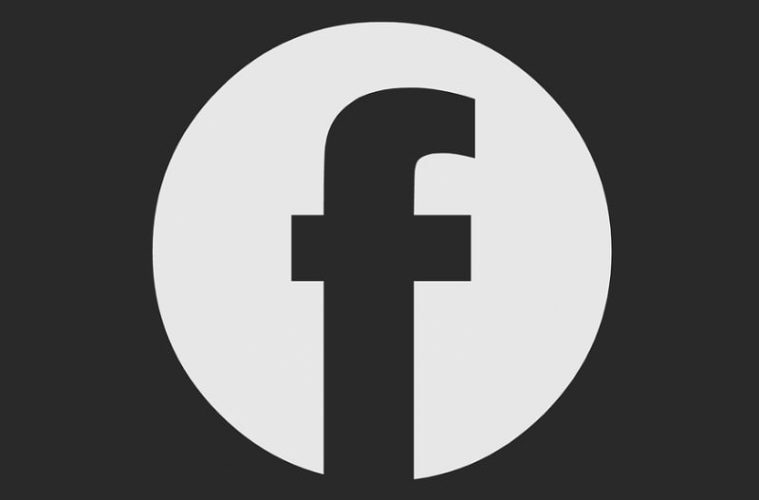 Friendly for Facebook is the best alternative to the official Facebook App. This App is lite and fast and the messenger App included. So, you don’t need to install a separate App just for messaging. Also, the App provides a Facebook video download option. And, with the premium version of Facebook, you can even block ads. This App basically adopts the mobile version of Facebook and messenger lite. 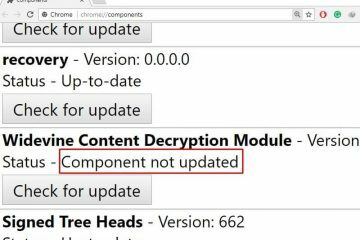 So, don’t worry about the security issue. You can also sort your news feed with the App. Also, the App allows to quickly switch between multiple Facebook accounts. And, the best thing about this App is Facebook Dark Mode. There is a dedicated night mode option within the Friendly for Facebook App. That activates the dark theme on Facebook. 1. Install Friendly for Facebook App from Play Store. 2. Open App, and log in with your Facebook Account. 3. On the Homepage, you can find out settings (gear icon) option. Tap on it, to access settings of the App. 4. Now, under Style & Appearance section, tap on Night Mode option. That’s it. Now in App dark theme will get activated. And, you can use Facebook in dark mode. Facebook Dark Mode in Firefox Android. 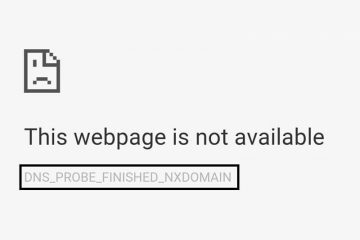 Chrome for Android doesn’t allow users to install extensions from the web store. Though, you can install Chrome extensions in Android’s Yandex Browser. But, I suggest you download the Firefox Browser. After Chrome, Firefox is the only browser that I like and trust most. And, there is an add-on available for Firefox. That allows enabling dark mode in the browser. And, surprisingly it works with Facebook Mobile site. So, If you don’t trust on above-mentioned App. Then, you can use the browser to access Facebook Dark Mode. 1. Install Firefox from Play Store. 2. Open Firefox App, Tap on three dots from the upper right corner. And, then tap on Add-ons option. Now, tap on the “Browse all Firefox Add-ons” option. 3. 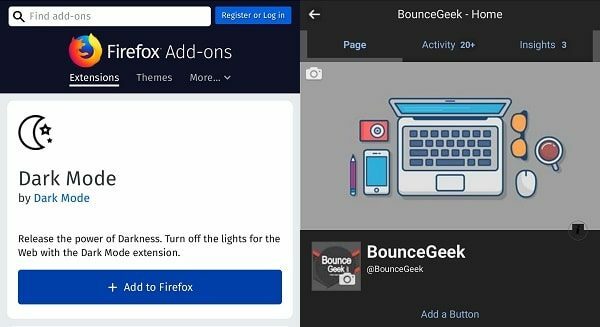 Firefox Add-ons page will get open, use the search option and search for the dark mode. Tap on the first Add-on. Tap on “+ Add to Firefox”. Add-on will now get added in your Firefox Android browser. 4. Now, open the Facebook site, and you can see dark mode got enabled on Facebook. Note: If you want to enable Facebook dark mode in your PC. Then, you can install an add-on or extension in your Chrome and Firefox Browser. In Chrome Web Store, just search for Dark Mode. Use Maki for Facebook and Messenger. If you’re Facebook Lite User, then I suggest you use Maki for Facebook App. App size is less than 5 MB. But, the feature that this App offers is very high. Maki App offers the Theming option, you can select between multiple themes. 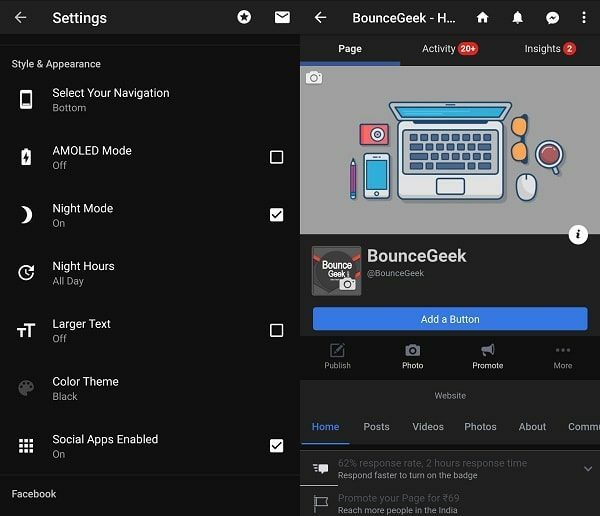 The material dark theme also available, which will help you to get dark mode on Facebook. The App comes with a falcon view feature. That helps the user to read an article without visiting the website. There is power saving mode also available within the App. This App comes with the messenger, so you don’t need to download a separate App for it. 1. Install Maki for Facebook and Messenger from Play Store. 2. Log in using your Facebook details. Tap on the three dots from the upper right corner. And, then tap on settings option. 3. In Maki Settings, Tap on General > Theme > Select “Material dark” theme. That’s it. Now Dark mode got activated in Maki for Facebook. 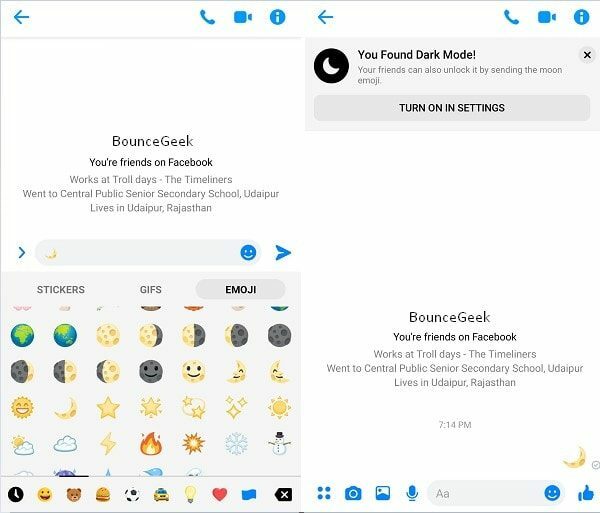 Activate Hidden Dark Mode in Messenger. Recently, In the latest version of Messenger App. Facebook Added a dark mode. Though, this option is not easily accessible in messenger settings. You have to active dark mode by sending moon emoji to any of your Facebook Friend. And, after sending the emoji, moon rain will get started. And, you will get an option to enable dark mode. I hope, soon the official Facebook App will also come with the same option. 2. 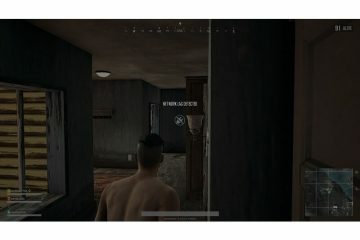 Now, open any chat window of your friend. Tap on emoji icon and then tap on EMOJI. 3. After sending the moon emoji, you will get a message “You Found Dark Mode!”. Tap on Turn on in Settings, and then in settings enable the dark mode. If you want to disable dark mode at any moment. Then, tap on your profile. And, then again tap on dark mode to disable. If you don’t like the interface of these two Facebook App alternatives. Then, you can try the modded version of the official Facebook App. This App is modded by an XDA developer. The app is completely the same as the official Facebook App. The only thing is different is dark mode. And, that’s what you’re looking for. Though, developer stopped working on this App. So, there is an older version available of this App. Though, it works absolutely fine. The size of this App is more than 100 MB, which is much than the original Facebook App. But, still, you can try this App if you like only the main Facebook App. Like Dark Facebook, there is a dark messenger app also available. But, now you don’t need it. 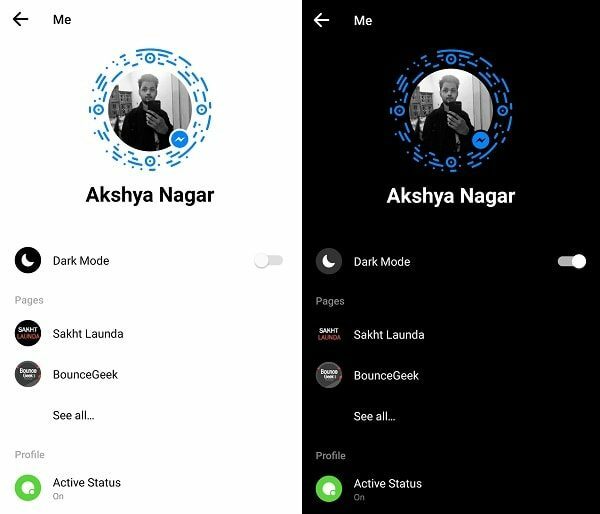 Because now night mode is officially available in messenger. IMPORTANT: To install the dark Facebook App, first, you need to uninstall your official Facebook App. Else, you will face error. 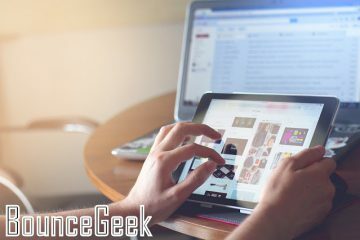 Previous ArticleInstall Android Q on PC and Google Pixel Devices. Next ArticleActivate Dark Mode on Instagram – Instagram dark mode. 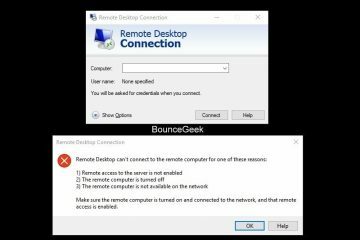 Fix Packet Loss – Check Packet loss causes and solutions.